Establish brand awareness, strengthen company image or build customer loyalty with UPrinting's custom postcards. 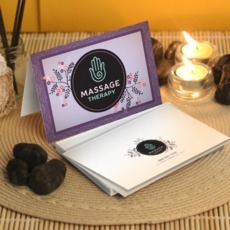 These can be printed as product information cards, event invitations or greeting cards. Make sure to pay attention to your text and to maximize the use of photos or graphics. Choosing postcards for your campaigns provides you with more options that can meet the requirements of your design. It is best to use 14 pt. cardstock, uncoated paper when in need of high-end marketing materials. 14 pt. gloss AQ coated is the most durable paper type, withstanding wear and tear. This is best when handing them out as card flyers in high foot traffic areas. With UPrinting, you can have your postcards delivered right at your customer's doorstep through our direct mailing service. You can have your customized postcards in 3 business days for folded postcards and 1 -2 business days for rush orders. Minimum quantity per order is 250, available with custom sizes. Give us a call at 1-888-888-4211 if you have questions about our custom postcard specifications. We are happy to assist you.